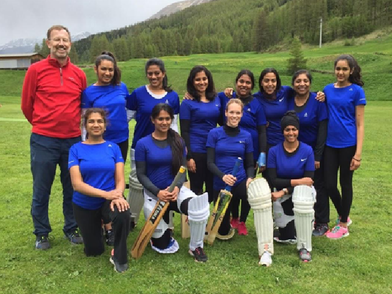 It's been less than two years since Cricket Switzerland, the governing body for cricket in Switzerland, established Zurich Sapphires, the first women’s cricket club in Switzerland. Since their inception, Zurich Sapphires has made a mark for their achievements, their relentless pursuit of the sport, and willingness to take on bigger challenges, all while having fun at the same time. On the 16th of July 2017, the Austrian National Cricket Ground played witness to a thrilling finale between the Switzerland and Austrian women’s cricket teams. 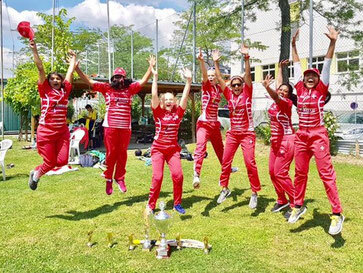 The Switzerland national women’s cricket team was playing the last of 5 matches against Austria in the annual Vienna Tournament. The Swiss squad was leading, having won 3 of the 4 matches they had played over the 5-match series. As the last Austrian wicket fell, the Swiss women’s cricket team cheered at the top of their voices, jubilant and exhilarated. What they had achieved was no mean feat. 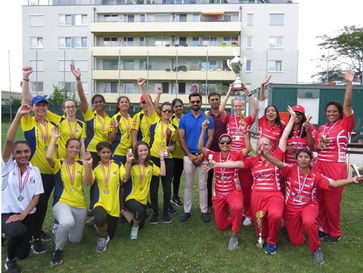 Switzerland had just won its first ever international cricket tournament, represented by the women in red. Cricket enthusiasts in Switzerland have been playing the sport recreationally from as early as the 19th century. The first known club, the Geneva Cricket Club, was established in 1872. Today there are 20 clubs that are affiliated to Cricket Switzerland, the governing body for cricket in Switzerland. There are 650+ registered senior and 350+ junior cricketers in over twenty clubs and schools. 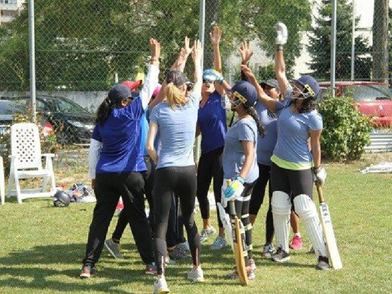 Women’s cricket in Switzerland was given a boost in 2016, when the first women's cricket club in Switzerland was established. Zurich Sapphires Cricket Club (ZSCC), as it is known, is an affiliate member of Cricket Switzerland. Veena Mampilly, President of ZSCC, traces the beginnings of the club back to 2015. With the support of the President of Cricket Switzerland, Alex Mackay and executive members of the organisation, she began contacting like-minded cricket enthusiasts to form a women’s team. The club took shape with 10 players initially. Now, ZSCC constitutes 22 active and passive members. In June 2016, just three months after the club was officially formed, the team went on to play their first regional tournament in Zuoz, Switzerland. The team won their first game on day 1 of the tournament, a victory that remains very dear to them. Team Captain, Jennifer Hallam reminisces fondly, “It felt like we had just won the World Cup!”. Their debut at Zuoz concluded on a high note when the best fielder award was given to Veena Mampilly in her role as the wicket-keeper. ZSCC had made its mark on the Cricket map of Switzerland. Since 2016, the team has played four tournaments, including two against national women’s teams in Europe. “It’s really fun to be able to collaborate, and learn from other competing teams. We also develop friendships during the tournaments”, says Jennifer. Generating an interest and getting members to join the women’s cricket club has had its fair share of challenges. In a country like Switzerland, where cricket is not so popular, newbies to the game tend to get intimidated by the seemingly complicated rules. ZSCC encourages new members who would like to try their hand at the game, and test their skills. Some members join with little to no background in playing cricket, and on joining the club, discover their natural talent at the game and stay as long-term members, such as current Captain, Jennifer Hallam. In addition to being a cricket club, they also actively encourage the social side of the club by organizing social events and friendly matches. Running a non-profit club too has its own challenges as well. The committee members, the unsung heroes of the team, put in a lot of effort behind the scenes. “Forming a club is a challenge, but sustaining it is really more challenging”, says Veena, who acknowledges that keeping the momentum going and making sure that players stay motivated are key to sustenance. The team trains throughout the year, including in winter. Training sessions are held every Saturday from 09:00-10:30. Training round the year improves team camaraderie and bonding. Zurich Sapphires is a mix of working professionals, and students. The players find cricket a stress buster and a good break from their work routine. With a majority of the committee members working full-time, the committee takes out time after work hours for their meetings. The women’s team has played at the Vienna tournament in both 2016 and 2017. In 2016, the team, playing as Zurich Sapphires, performed well, despite being relatively new as compared to their counterparts, Belgium, Austria, Norway, who have significantly more experience playing internationally. In 2017, the team headed to Austria again, but this time, representing Switzerland as the national women’s squad, a big leap from the previous year. Support for the women’s team has come from different quarters. Wintech Sports, a London-based supplier to the national cricket team, decided to sponsor the women’s official jerseys for the tournament. “This was a big encouragement, and a clear sign that women’s cricket in Switzerland is really progressing”, says Veena, smiling brightly. The 2017 Vienna tournament was a defining moment for the women’s team. The team gave it their best, and their subsequent victory was a big boost to the squad. “A tournament such as this brings everyone together on the same page. Everyone played to win”, says Veena. Team member Paulina Kratka was declared player of the series, and the team was awarded a trophy by well-known Pakistani cricketer, Mohammad Hafeez. The triumphant women took pride in explaining how they won the trophy to fellow passengers who lauded them on their flight back home. The team is now looking forward to competing again next year. Cricket in Switzerland received a boost In November this year, when the Swiss Sport Parliament accepted Cricket Switzerland's application to become a member of Swiss Olympic. Beginning 1st January 2018, Swiss cricket is set to be recognised as an official sport in Switzerland. Cricket Switzerland has also turned in its application towards being part of the ICC, and is hopeful for this to materialise soon. In 2018, the women’s cricket team hopes to organise a tournament on home ground, and play host to Austria and other countries. Speaking to the captain and president of Zurich Sapphires, it is easy to see why they chose the name ‘Sapphires’. Their passion and infectious enthusiasm to get the ball rolling for women’s cricket in Switzerland shines bright and strong. 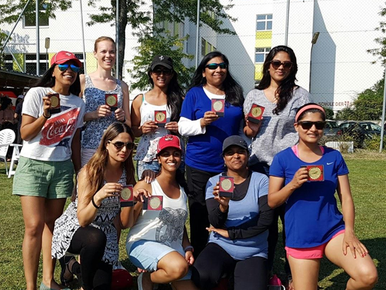 With ZSCC as the first step to Women’s Cricket, Cricket Switzerland is looking to expand this initiative to other regions within Switzerland and encourage all women to participate and join in this journey. For more details on ZSCC visit the Zurich Sapphire's website or women’s cricket in Switzerland. Note: This article was first written for Namaste Switzerland and appeared in the December issue of their magazine released on Friday 9th December 2017.